I have been really tardy with the blog. I blame it on the heat. Really, it's been so unbelievably hot in Paris. I went shopping yesterday looking for summer clothes, with a goal to wear as little as I could while still look, um, half way decent. It's been that kind of heat. Paris is as much fun as ever. I've had quite a full schedule two lunches at L'Astrance -one of which was in the delightful company of Les Girls Louisa and Clotilde -where we ate and laughed and drank and said grace with our little cameras-, roasted a Poulet de Bresse, had tartine with David, got all végétable-d with Pascale, trekked out to Chatillon for couscous, had yet another wonderful meal at Le Meurice, this time a lovely lunch, also a delicious dinner at L'Entredgeu and L'Os à Moelle and many other lovely little bistros. Next week I have another lunch at L'Ambroisie and a dinner at Gagnaire. Goodness when will I ever have time to blog about it all. 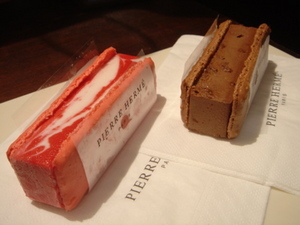 I've been going into Pierre Hermé nearly everyday, for a few macarons or -since the heat wave- for a Miss Gla Gla Ispahan, an ultimate icecream sandwich made of rose macaron biscuits and raspberry and litchi sorbet.